Many people love to exercise on a daily basis. It helps them to relax, take the stress out of work, taking care of children, and there are numerous exercising programs that are available. Some enjoy going to a gym where there are many different exercising activities to choose from. Other people enjoy exercising from a video or a television show in the early morning hours while in the comfort of their home. Many people will spend thousands of dollars to get just the right outfit, the right type of shoes, the right particular trainer to get into the best shape they can, while other people who exercise choose a less expensive path to take. Putting on running shoes, dressing in their running outfit of ordinary sweats, putting their hair back and strapping on the amazing filtered water bottle to their waist it is now time to start exercising. The one thing that many people forget to do while exercising is to drink plenty of water. People will drink after they get back home, but during exercising the body needs to be replenished with water. There are other drinks that a person can use, however drinking water is better for the body. It has no sugar that will give a person a quick high, then come crashing down a few minutes later. Before heading out for your morning job, fill your jogging water bottle up with cold water and you are now ready to head outside for your run. 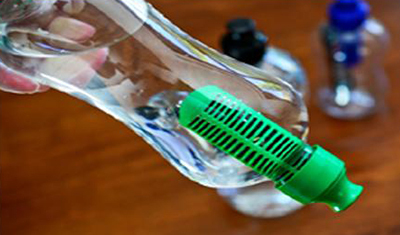 There are many different types of water holders that can easily carry one to three bottles of water while a person is jogging. These great personalized water bottles are light weight with a tight lid to keep the water inside. The water bottles are held securely in place with a water belt and will not bounce around or fall out while the person is jogging. Some people like to have the water bottle around their waist, while other people find it easier to hold the water bottle in their hand while running and others like the idea of strapping a small water bottle to their wrist. It is up to each jogger as to what they feel comfortable with. Having a water bottle or bottles is the best way to quench your thirst when jogging. This entry was posted in Outdoor Activity, Travel accessories, Travel must have and tagged water bottles on July 23, 2013 by Yami.